Deck replacement is a big undertaking and for many, one that is put off until it’s too late. Is it time for you to replace your deck? Take a look at this list from Harmony Decking. If one or more things apply, you may need a replacement. You might need to repair or replace your deck if…. How could your deck not be up to code? Well, some decks are older than NJ and PA regulations, so they were built before some important regulations were introduced. In these states, a deck has to be 30” above grade level and be surrounded by a railing with spindles no further apart than 4”. If your deck doesn’t fit these criteria, it’s time for a new one. If you, a family member, or a guest has injured themselves on a loose screw, nail, or gnarly piece of wood, it’s time to give your deck an upgrade. Sometimes this can mean just replacing a few boards. But in other instances, your deck may be too far gone and you will need to replace it entirely. 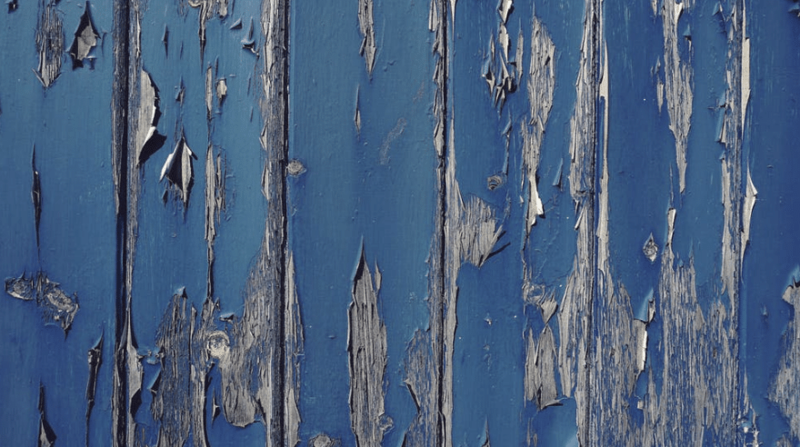 Stains and other marks can be an ugly feature on a once pristine deck, but that’s not why they are a cause for replacement. Marks, scuffs, and other stains can interfere with the sealant or protective coating of your deck. This can result in peeling, moisture exposure, and rotting. These stains may not lead to a full deck remodel, but they do require further inspection to determine the extent of the damage. This one may seem like a no-brainer, but if you have broken or damaged boards on your deck, they need to be replaced ASAP. Weaknesses in some boards can lead to overcompensation by others. This means there can be more damage and potential for injury in the future. Any of these danger signs could mean that you need a deck replacement or some repairs at the very least. If you think your deck is in need of a little TLC, we strongly recommend you give us a call. At Harmony Decking, we put your happiness and safety first, and it is our goal to help you create (or maintain) the deck of your dreams. What are you waiting for? Give us a call at (215) 290-7727 today or send an email to harmonydecking@verizon.net to learn more! Daylight Savings means you finally get some after-work sunshine, but before you can really enjoy the great outdoors, your deck probably needs a little TLC. Don’t worry, with these tips you’ll be spring cleaning your deck and ready to kick back and relax in no time. Harsh weather and drastic temperature changes can wreak havoc on both the look and structural integrity of your railings. The last thing you want is for them to give way and break at a time when you need them the most. Have your railings inspected by a decking expert to ensure that they are in good shape to keep you safe. If your railings are weak – or worse, rotting away – give them an update! 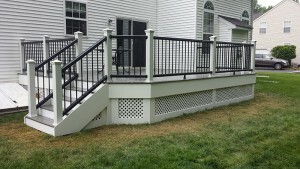 A fresh set of railings can not only help give you peace of mind that your deck is safe, they can also give your deck a total makeover for a fraction of the cost of a full reno. Winter’s constant snow and ice can leave your deck looking lackluster and dull. The mild spring temperatures are the perfect time to spruce things up before the drying summer sun rolls around. A soft scrubber brush is the best way to dig out all the nasty dirt, and a semi transparent stain gives the perfect protective finish. After spending the cold winter cooped up inside, scrolling Pinterest for inspiration, spring is your time to shine! 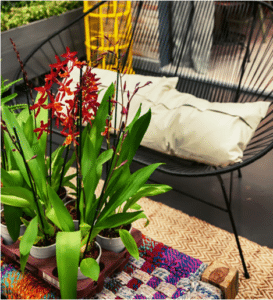 Use that inspo board of yours to load your deck up with seasonal plants, decorative pillows, and even an outdoor rug or two. You don’t have to worry about ice and snow wrecking your decor anymore, so it’s time to get creative! Spring Cleaning Your Deck? 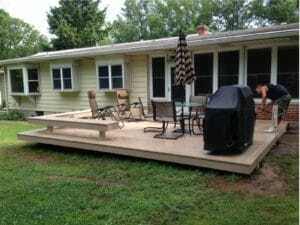 – Give Harmony Decking a Call! If all this talk about spring cleaning your deck has you wistful for a deck of your own, give us a call at (215) 290-7727! We’d love to help you build the deck of your dreams. With just a few weeks left until spring, it’s time to start planning your outdoor projects for the year! Maybe you’re finally ready to build that beautiful outdoor space you’ve been thinking about for ages, but you just don’t know where to begin! Have no fear – Harmony Decking has the ultimate guide to different deck styles to help you get started. Ground Level Decks – Simply structured, ground level decks can be placed on flat or slightly sloped ground. Their low elevation means that they typically don’t require a railing, which makes them a great, low-profile extension of your home into the outdoors. Raised Decks – If your backyard is a bit bumpier, or you’re looking to build off of your second floor, raised decks are a common way to give outdoor access to upper floors, or work around a slanted backyard. Due to their height, raised decks always require a railing. Wraparound Decks – Perfect for homes with multiple entrances, wraparound decks do just that – wrap around your home. Wraparound decks are popular for their ability to offer varying levels of sun and shade around the house, in addition to being able to support entertainment for larger groups. Depending on their elevation, wraparound decks may be built with or without railings. Multi-Level Decks – If you’re really looking to go all out, multi level decks are an amazing way to build an experience in your own backyard. Varying elevations allow for spaces to take on different functions for grilling, entertaining, and more. Multi-level decks are the most complex to design and construct, but they are well worth it in the end. Now that you have an overview of options for different deck styles, it’s time to get to work! Whether you have something specific in mind or need guidance from the experts, give us a call at (215)-290-7727 to get started on your dream deck today! Be sure to view pictures of our work for more inspiration! Last month we talked about how to prepare your deck for winter, but what about keeping it in good shape during these wet and chilly months? Today we’re going to talk about our favorite winter deck tips and how you can keep your deck looking great all season long. The cold weather and threat of snow make it difficult to use your deck very often in the winter, but that doesn’t mean it’s time to neglect your outdoor space. Caring for your deck in the winter is one of the most important ways to ensure you have no surprises come springtime. Before the first snow hits, it’s a good idea to give your deck a good scrub. 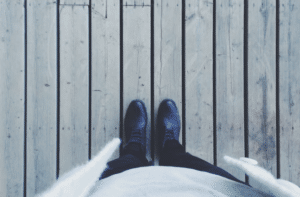 Over time, wood stains can actually cause your deck to deteriorate, and they can be easy to forget about once they’re covered in a blanket of snow and ice. The last thing you want to walk out onto in the springtime is a warped or worn-away deck! Speaking of ice, we recommend using a de-icer on your deck to avoid that slippery covering, but it’s vital that your de-icer is safe for your deck. Rock salt can contain harsh chemicals that actually make deck stains and corrosion worse. Opt for a safer alternative like ammonia sulfate to keep your deck de-iced (and stain free!). Metal shovels may seem like a great way to scrape up the ice and snow covering your deck, but they can also scrape or dent the wood and leave you with a scratched up mess come springtime. When you shovel, choose a sturdy plastic and be sure to go with the grain of the wood, not against it. Did all this talk of winter deck tips leave you dreaming of a deck of your own? Start planning today by contacting Harmony Decking. Call 215-290-7727, or fill out our contact form to get started today! 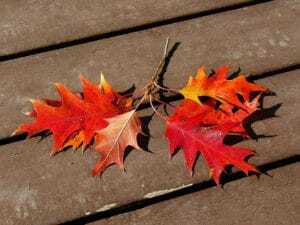 Deck Maintenance: How Do I Prepare My Deck for Winter? Around this time every year, homeowners find themselves wondering: how do I prepare my deck for winter? Harmony Decking has the answer. 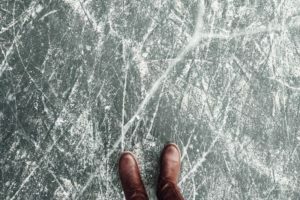 Dropping temperatures and constant threats of snow and ice can shorten the life of your deck and lead to expensive repairs or even a full deck replacement over time. Fortunately, you can avoid these problems by winterizing your deck in a few easy steps. Examining your ledger board, where the deck attaches to the house. Ensure that all fasteners are secure. Take a look at all of the support posts and joists to make sure that they are structurally sound. This may mean getting on the ground or underneath your deck to get a proper view. Look around for loose screws or nails and tighten or drive in as necessary. Check for spots where water collects and address as necessary. Test your handrails, railings and stairs to make sure they are secure. If you have children or elderly members in your household, it may be a good idea to add abrasive strips to the stairs to avoid slip and fall events in the icy winter. Clearing the deck of all furniture, planters, grills, etc. and storing them in a safe, dry place if possible. We have an excellent guide for storing outdoor furniture if you are unsure of where to best keep these items. Using mild detergent with a hose or the lowest setting on a pressure washer, thoroughly clean the surface of your deck to remove dirt, stains, and mold. If any finishes are peeling away or deteriorating, remove them,. This limits the extent of the damage and gives your deck an overall fresher appearance. Clear the deck of all furniture, planters, grills, etc. and sweep or leaf-blow the entire surface. If possible, store these items in a safe, dry place for the winter. With a mild detergent and water (using a hose or pressure washer at the lowest setting), thoroughly clean the deck surface to remove dirt, stains, and mold. Remove any finishes that are peeling away or deteriorating to limit the extent of the damage and to give it a fresher overall appearance. You should seal your deck annually with a water repellant to prevent slow water damage over time. If you haven’t sealed your deck within the last year, now is a great time to get it done! Simply follow the manufacturer instructions for the sealant of your choice and ta-da! Your deck is ready for winter. Next time you find yourself wondering “How do I prepare my deck for winter?” give Harmony Decking a call. At Harmony Decking, we care about your home and your investment. If you or someone you know needs help with these tasks, contact us today – we’re happy to assist with preventative maintenance! You can be sure we’ll do the job right the first time, every time. Rapidly dropping temperatures and the looming threat of snow can leave some deck owners in a panic when it comes to winter outdoor furniture storage. What should I do with my outdoor furniture? Can I leave it outside? Do I need to put it in my house? What will happen if I let it sit out all winter? The answer to all of these questions comes down to one factor: material. It’s key to understand the material that your outdoor furniture is made of in order to make an educated decision about where to store it in the winter. 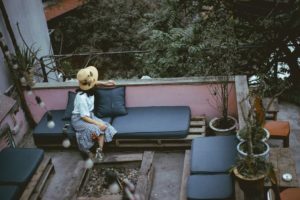 We know it can be complicated to search for the various ways to care for the many materials used to make outdoor furniture, so we put together this helpful guide so that you know exactly what to do with your outdoor furniture this season. The many pores and cracks in wicker furniture make it susceptible to expanding and contracting with changes in moisture, meaning your furniture may be cracked come springtime. Bring your wicker furniture indoors if you’re not looking to replace it once the weather warms up. Steel-framed furniture is another type that is vulnerable to changes in moisture and temperature. The risks of rust and cracking increase over time, so you’re better off bringing it inside and away from the elements this winter. Known for its light weight, you wouldn’t think that aluminum would be able to stand up to the harsh winter elements, but aluminum is actually the toughest of all patio furniture. If you lack the indoor space to clear away your outdoor furniture, or you just don’t feel like bringing it indoors – aluminum outdoor furniture is the choice for you! The cracks and crevices that make natural stone furniture so pretty are also responsible for making it at risk of breaking if left out in the winter. If water enters the cracks and expands with the cold, your favorite tabletop could wind up breaking in two! You should already be putting away your outdoor cushions and pillows when they aren’t in use, but if you like leaving them out all season, you should be warned that they don’t fare so well in the harsh winter temperatures. Save yourself the hassle of replacing your fabric materials in the spring and bring in your pillows and cushions before winter hits. If all this talk about winter outdoor furniture storage has you itching to create an outdoor space of your own, contact Harmony Decking today! Started by two friends who value honesty, Harmony Decking always aims to provide great work for a fair price. Give us a call today so we can prove that when you work with us, your project is in good hands. Cooler fall temps are finally upon us, which makes now the perfect time to be outside. With a little bit of time and effort, you can get your fall deck in its best shape. And if you’re in the mood for a little updating, there are some amazing new trends that lend themselves to the beautiful fall hues. There’s nothing more lovely than viewing the fall foliage from the comfort of your own deck. 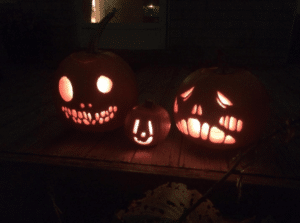 And there’s nothing more unappealing than a rotting pumpkin or decaying piles of leaves. As much as we all love to decorate for the fall, it’s important to remember to be timely about cleaning these wet messes. Even the morning dew can add more moisture than you think and make those piles of leaves wet enough to cause unsightly damage to your deck. Speaking of fall colors, deep reds and warm browns offer a stunning alternative for your decking options. If you’re considering updating your deck or building a new deck, consider an autumn-inspired color combination. These color schemes not only lend themselves to autumn hues but will look beautiful all year round. At Harmony Decking, we prefer AZEK’s composite decking because of its high quality. What we love even more is their Harvest Decking Collection. With coordinating planks and rails, it’s easy to choose a stunning combination. Feeling a little spicy? Check out their ravishing reds’ collection. Another striking update is adding a portable fireplace or electric bonfire. With designs to fit every theme and color scheme, this addition is a dazzling feature that will lengthen the time you can enjoy your deck. Even more importantly, these electric fireplaces and portable bonfires are both safe for your composite deck. They make the perfect addition for creating a beautiful warm ambience. If you prefer something that takes up less space but still provides light, consider adding in deck lighting. This fall, make your deck a place you love again. Don’t wait for spring to roll back around. Call Harmony Decking today at 215-290-7727. As summer weather slowly fades, we may find some respite in the cooler weather of autumn. While the days are growing shorter, there are still plenty of ways to enjoy our outdoor spaces—and plenty of time for tackling fall deck maintenance. They provide safe harbor for pesky allergens. Mold and pollen linger in leaf piles, irritating autumnal allergies. They give home to all sorts of creepy crawlers. You may not mind bugs, but we doubt you want them to set up shop on your deck. Allowing leaves to sit in a wet moldy pile invites beetles, spiders, and other insects that make your deck unsightly. Of course, for major bug infestations, you may need to try some serious combat. They allowed for discoloration and damage due to mold growth. Mold is one of the biggest culprits of major home destruction. Don’t allow avoidance of a chore to lead to moldy mayhem. For these reasons, it’s best to sweep up leaves on a weekly basis. Scope out the beams, posts, rails, and steps on your deck. If you notice any wobbling parts or wider gaps, repair them immediately. Of course, a professional deck company is your best bet to ensure that you don’t miss any problems, but independently inspecting your deck can go a long way towards finding problems before they become worse. Sometimes as we wind towards fall, we think cleaning our decks isn’t as necessary because we don’t intend to use it on a regular basis. This could not be farther from the truth. Giving your deck a good scrub or pressure wash to remove all remaining debris and gunk. If you have a wood deck, follow that up with a fresh coat of water repellent sealant to protect from the upcoming winter weather. Not loving your deck lately, or feeling overwhelmed at the thought of how to make it fresh and new? Contact our team at Harmony Decking today. We’ll help you find a way to make your deck a place you love again. Ah, summer. The perfect time to kick back, relax, and… swat at gnats? Chase bees away? Smack mosquitos off your arms? It’s likely that none of those statements finish the sentence the way you want, but they certainly apply to the month of August in the Delaware Valley. Air that is swelteringly humid and annoyingly buggy is all around. So, what can you do about pesky bugs invading your backyard oasis? Plenty! We’ve got a plan to debug your Montgomery County deck. Do you see holes in your wood or composite deck? Or perhaps sawdust piles? If so, you may have an issue with termites, carpenter bees, carpenter ants, or beetles. Are you and your loved ones coming in covered in swollen red bites? While mosquitos are a likely culprit, you mustn’t rule out spider bites. Do you find yourself swatting the air constantly as you sit outside? Whether gnats, flies, or something more vicious, all are troublemakers. Treat your deck for carpenter bee or termite problems. For wood decks, apply a protective sealant. Clear out any brush near your deck to make it less bug-friendly. This has the added bonus of keeping rodents and small animals away, too! Search around and under your deck for standing water, which attracts flies and mosquitos. If found, fill with rocks or gravel, or redirect the water that pooled there. Sweep away any piles of debris or signs of cobwebs to remove potential friendly space for unwanted creepers. Call an exterminator for serious repeat offenders that don’t respond to the steps above. Contact your local deck expert at Harmony Decking for other structural suggestions to make your outdoor space the haven you deserve! Bugs and/or rodents can harm the structure of your deck, not just your enjoyment of the outdoors. If allowed to roam unabated, these pests can cause critical (and expensive) damage. Treat any issues as soon as you notice them to avoid bigger problems. Neither avoiding your deck nor ignoring the bugs is a smart solution. For all your Montgomery County deck needs, call Harmony Decking. We love create outdoor oases for our customers. Let us help you perfect your deck paradise and make it the backyard retreat you long for. When you think about your deck, most of your time, energy, and budget goes into the basics: deck furniture, deck installation, and maintenance. However, there is an up-and-coming trend in deck design: deck lighting. Increased opportunities abound to enhance your deck’s ambiance through creative lighting. Our team at Harmony Decking loves constructing the perfect deck for every home. That means that for the perfect deck, we use only the highest quality products from TimberTechⓇ and AzekⓇ. Check out our favorite lighting options produced by these top-tier companies. Accent Lights: For understated lighting that adds a soft and subtle glow, we recommend adding accent lights. Installing them on a vertical surface, such as railings, creates an effect of a cascading waterfall of light. 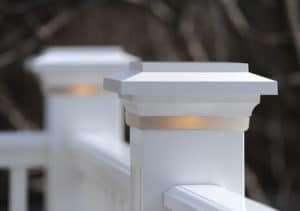 Post Cap Lights: We can easily install post cap lights directly in between your railing and railing caps. The effect is unassumingly elegant—a truly spectacular option. In-Deck Lights: In-deck lights can be easily mounted within your composite deck surface space. They are unobtrusive and small enough to fit in any available space. But we especially like to use them around deck perimeters for added safety and a soft, warm glow. Riser Lights: Riser lights are installed directly in your risers, or stairs. More than just a simple addition of luminous lighting, these lights are a sparkling safety feature. Similar to movie theater lighting, riser lights light the pathway up the stairs at night. Under-Rail Lights: Another ambient lighting and stellar safety feature, under-rail lights are the perfect partnership between aesthetics and safety. No matter what your color scheme or lighting needs are, Harmony Decking can help! There are countless lighting options, and lighting is a great way to highlight your deck’s features and make it safer and more enjoyable for your family and friends. There is still plenty of deck weather remaining this season. Don’t miss out on beautiful deck days and memorable deck nights. Call Harmony Decking today for a consultation on creating your dream deck for this season and many more to come.